**Meets new MUTCD reflectivity requirements** Nikkalite Brand Super Engineering Grade (SEG) Type 2 retro-reflective sheeting is a beaded material that renders high retro-reflectivity at night. It is twice as bright as engineer grade films and designed for Sign Lettering and Backgrounds but can be used in a variety of applications. It is highly resistant to the extremes of hot, cold, dry, and humid weather conditions. Signs sheeted and lettered with Nikkalite Super Engineer Type 2 sheeting are both attractive in appearance and highly visible during both day and night. This contributes greatly to driving safety. This sheeting is available in seven standard colors with a pre-coated, pressure-sensitive (PS) adhesive. Small stars printed into the material designate it as super engineer grade. The stars are subtle and are visible upon a close inspection of the material. The super engineer grade rolls come in 150' lengths and in 12", 24", 30", 36", and 48" widths. This material is easily cut into letters and graphics with a standard vinyl plotter/cutter. The film can also be used as a background. The reflectivity is 180 candlepower for the white. The colors available are white, yellow, red, blue, green, brown and orange. Super engineer grade sheeting carries a 12 year warranty from the manufacturer. 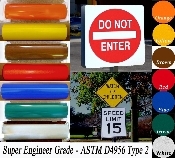 It is designed to meet MUTCD requirements for all ground mounted signs at a much lower price than diamond grade films. You can make your color and width selection by using the drop down menus above. Rolls on this page are 150 feet long.